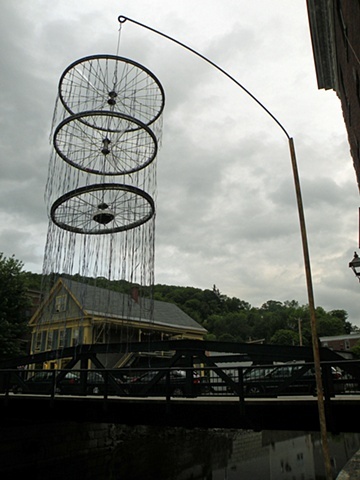 Rain Machine is installed above the river for Montpelier, Vermont's second annual SculptCycle. Note the dark clouds gathering as it does its work. The fine drizzle of blue and gray cotton fiber are suggestive of rain, softly falling from a vortex of circles. The fibers are treated to preserve strength and color in an outdoor environment.